myFavs is a powerful, easy to use 'Bookmark Manager' for all bookmark enthusiasts . It inputs a text file of User Favorites and outputs a "myFavs.Html" page of sorted dropDown Menus/Links. How to extract: Download the ZIP package and extract to a folder of your choice. Launch myFavs.exe. View-Folder Button for myFavs Folder. Change Colors Button to change color scheme' of Gui and 'myFavsLinks.html' output file. use the delimeter [ ] after each field: MenuNameLinkDescriptionLinkAddress & also read the Help . 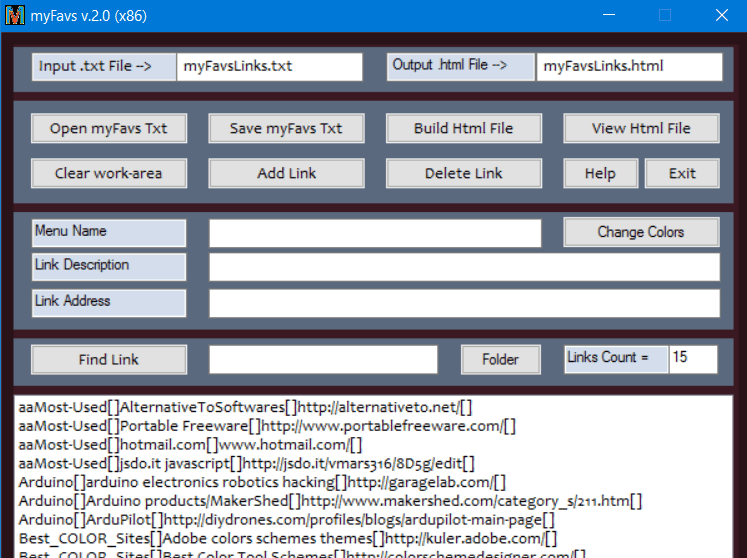 But the best and safe way is to just add your links to myStarterLinks.txt example file . Then save it as (whatever) Guido76Links.txt . Probably a great tool, but .. how to get a .txt file of my bookmarks, furthermore, compatible with this software ...? I searched a lot, but I have not yet found the solution with Firefox: I only get a .json files... Or build itself the file with a text editor ? then you no longer need myFavs!